Glad to see that folks have been checking the blog whenever I advertise a new post! Typepad lets you check your stats (daily views, etc.) and it's always encouraging to see the readership numbers! A couple things on the recycling issue (from my last post). Dunkin has not responded yet but their online email form did say that it may take a while as I'm sure they receive thousands of emails per day. I started thinking about styrofoam recycling today. 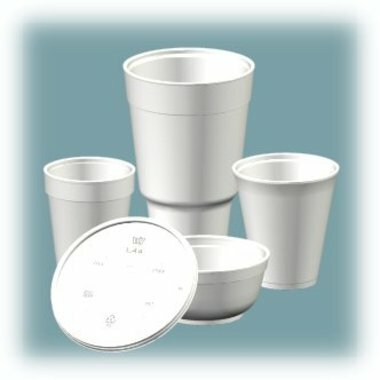 Styrofoam is the trademark name of a Dow product - but Americans use this term generically to refer to all polystyrene foam products, cups, plates, peanuts, etc. Anyways... Dunkin uses styrofoam cups for most of its hot beverages. They still use paper cups if you order a small coffee or tea (and that's why I always stick to the small). But, is it really better to use paper? A cup-maker offers a pro-foam argument. (Biased you say? - Here's another article from an environmental source. You can even build houses out of the stuff!!) With the temperatures dropping here in the Northeast and with coffee being preferred as a hot beverage, Dunkin uses a LOT of foam. Some communities like the University of Vermont and private industrial recycling services offer recycling for foam products. Does your community offer this service? In my experience, the only residential recycling offered here in the Northeast is for #1 and #2 plastics, bottles, metals/cans, and paper goods. I suspect that these goods are the easiest to recycle and are the most profitable for the recycler. A private recycling facility in PA allows you to mail in packaging foam to them but that seems to be a bit costly! Millcreek PA offers recycling of the typical packaging styrofoam which is different from the regular foam used in coffee cups. Confused? Here's some more facts about foam. Either way, it seems difficult to recycle foam coffee cups unless you go to the University of Vermont. Grrrr. So, what can we do? How do we convince the big chain stores like Dunkin Donuts to offer recycling for its foam coffee cups as well as its plastic cups? We know the technology is there. Is it too costly for these companies to recycle? But what if the greening and public image qualities of a recycling program outweigh the costs of the actual recycling? Could a recycling program boost sales enough to cover the costs? If you have stats on these issues, please send them my way! JBC plays at TRIO this SATURDAY!!! All Ages show, 21 to drink. Come on down for some tasty beverages, great food, good people, and the JBC!!! ANOTHER NOTE: We're having t-shirts and stickers printed for the band this week. We are very excited to be able to have stickers to hand out to fans as well as shirts for sale at our upcoming gigs! Thanks to Bryan for hooking us up with a gig at the Mirror Image party this Friday and thanks to Lara, Heather, and Sarah for working on this for us!!! The t-shirts will have the "baby with headphones" logo on a brown shirt, much like the logo below. We'll have all sizes available as well as shirts for the ladies! FINALLY, have you seen Dominic's new blog? It's freakin hillarious! Check it out if you're in need of a laugh. Maybe you have to know Dom to get the humor, but I think it's a riot either way you cut it. :) Keep up the good work Dommers!!! YAY shirts! i call one!